New Casinos is launching an interview series with representatives of prominent sites being asked about the plans and expected events on the market in the coming year of 2018. The first interview is with 10 Bet Casino, one of the leading sports betting and online casino sites in the UK. London, United Kingdom, December 17, 2017 --(PR.com)-- The popular interviews with some of the market's leading products are back to give game-interested insights into how the casino market will develop in 2018. This year's interviews of new casino sites is a bit more extensive than the 2017 interviews, including, among other things, how companies perceive that the market will develop and change in the coming year. Several of the companies interviewed are positive to the upcoming licensing changes and predict that there will be more specialization in 2018. Edward Ihre, CEO of Codeta, answers the question of what he thinks will be the big difference next year, "I think we'll see further specialization and customer focus. After years of operators with the rightly equal range of games, but also similar positioning, advertising and promotions, it will inevitably be that the various operators need to differentiate themselves and prove their consumer eligibility to the consumer." Mia Sol Stølen, affiliate manager at 10 Bet, explains about their expansion plans in the beginning of 2018. “10 Bet will soon open the doors to Indian players, and we’re also preparing to enter the GCC (Gulf Cooperation Council) and Japanese markets in 2018,” she says. Like last year, companies are questioning new and innovative payment methods and game developers. The interviews end each time with a question about the number of new casinos to be released in 2018. Bruno Berlafa from the recently released High Roller and the now established Kaboo, was the one who scored the best last year with a guess of between 150-200 new sites released in 2017. 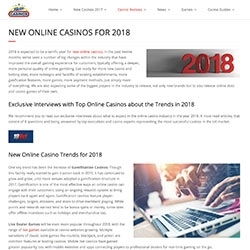 All new interviews will be visible in the news section at new-casinos.uk and they can also be found at the overview page about casino trends for 2018. Note: This is a product news release. The media releases can be found at https://www.catenamedia.com/media/press-releases/. NewCasinos.com & new-casinos.uk has been a part of Catena Media since 25th of May, 2017 and focuses on reviews of new casino brands worldwide.